Long ago, in a kingdom far away JC, aka Castwell, and I bumped into each other in a Forest Service campground on the banks of the South Branch of Michigan's Au Sable River, and the rest, as they say, is history. The exact details of that first encounter are best left to our collective memory, but over the course of the next several years a friendship developed that continues to influence both of our lives. We each spent our weekends fly fishing the South Branch of the Au Sable, and it was natural for us to start fishing together. It soon became apparent that in addition to fly fishing we had other shared interests; hunting, camping, photography, and an insatiable curiosity about all aspects of fly fishing. I also discovered that JC had some interesting quirks like eating toad's legs, but otherwise he seemed sane enough. We were both members of a fledgling organization called Trout Unlimited that was conceived by a group of men right on the Au Sable River, and over the intervening years we came to know many of the founding fathers of that organization on a first name basis. In time we would both become very active in TU, serving on the board, hosting stream clean-ups and stream improvement projects, conducting casting clinics, and authoring articles for our local newsletters and the national magazine. Early in our friendship we began to develop an intense interest in understanding aquatic insects, and soon JC's basement was filled with aquariums containing mayfly nymphs and other aquatic insects that we collected on the Au Sable. JC began to photograph the nymphs and adults, and from those photographs we began to develop new fly patterns and improvements on old standards. JC's techniques for photographing trout stream insects were developed by trial and error and many of those early photographs are still as good as any that have been taken since. JC was a great innovator in many arenas from photography to fly tying, and in those early years he was constantly coming up with new and ingenious ideas to improve our fly fishing abilities. JC starting experimenting with photographing live mayflies from below the surface of the water in an attempt to discover how live insects look to the trout, and as a result of those efforts we met Vince Marinaro who had pioneered similar efforts over 20 years earlier. During those years Michigan was a hot bed of fly fishing innovators. 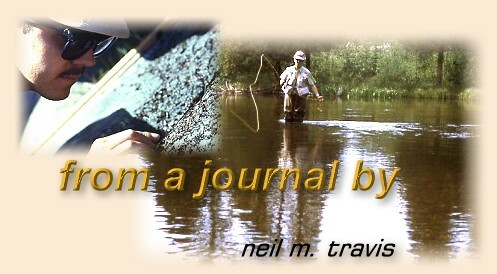 On the North Branch of the Au Sable two men that were destined to change the course of fly fishing; Carl Richards and Doug Swisher, were working on their pioneering work, and we were fortunate to make their acquaintance. Much of their work was similar to what JC and I were doing, but we were not working on a book. In retrospect, perhaps we should have been. In an effort to make a contribution to fly fishing and also to get free fly fishing gear we put together a business called American Field Test and Research Specialists. Soon we were field testing all kinds of fly fishing gear from such companies as Orvis, Scientific Anglers, Hodgman, and several other lesser known manufacturers. We began to put on one day fly fishing clinics at local high schools, and three day fly fishing schools on the Au Sable River. We both were teaching fly tying, and I was teaching a class on the history of fly fishing and angling literature. In between all this activity we actually got sometime to fish. It was those days on the Au Sable that still resonate in my memory as some of the finest times that JC and I shared. In those days both of us were pipe smokers, and as the sun hung on the horizon balanced between daylight and dark we would be found sitting on a log along the Au Sable River, fly rods balanced across our legs, pipe smoke drifting away on the evening breeze while we waited for the hatch to begin. Later, thoroughly chilled from several hours waist deep in the tannin stained waters of the Au Sable, we would sit around a campfire eating hot dogs roasted over the coals and rehash the events of the evening. In the spring of 1971 we were driving home from an early spring expedition to catch spring run steelhead on the Pere Marquette River when we started talking about a fishing trip out west. In September 1971 JC, Ole Olson and I were headed toward our greatest fly fishing adventure, 10 days in Idaho, Wyoming and Montana fly fishing for trout. We fished the Henry's Fork, the Madison, Firehole, Hebgen Lake, and Nelson's Spring Creek in a whirlwind trip that solidified a desire in JC and me to live there someday. Little did we know that within three years we would both be residents of Montana. Once in Montana the idealized dreams of spending our days chasing wild trout gave way to the hard realities of life. Living was not easy in those days in Montana, and much of our time was spent trying to make a living for our families. 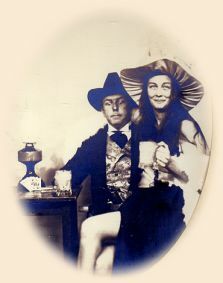 JC and the LadyFisher tried many endeavors including milking rattlesnakes for venom, and making jewelry, belts and hat bands out of their skins. Ultimately they drifted away to the coast of Washington, and in the course of time they started an On-line Fly Fishing magazine called Fly Angler's On Line. Like the stream running to the ocean and then returning in the form of rain the circle was completed. Although time and distance have separated JC and me, those days on the Au Sable and the relationship they created have shaped both of our lives in ways that neither of us could have ever imagined back then.